The film "RBG" is a documentary exploring Supreme Court Justice Ruth Bader Ginsburg's life and career. 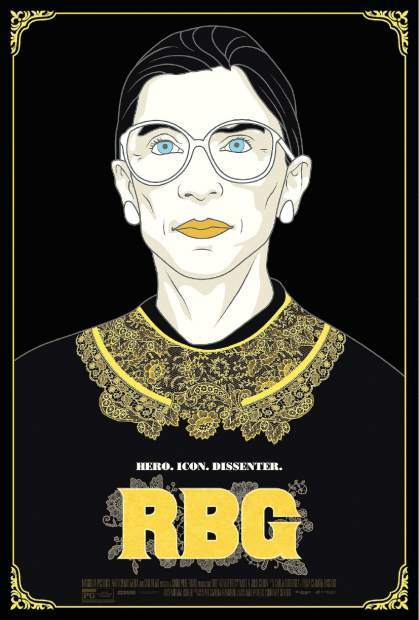 Cinema at the State Theatre in Auburn presents “RBG” at 7 p.m. Thursday, Sept. 6. “RBG” is the first biographical film about U.S. Supreme Court Justice Ruth Bader Ginsburg. At age 85, Ginsburg has developed a breathtaking legal legacy while becoming an unexpected pop culture icon. But the unique personal journey of this diminutive, quiet warrior’s rise to the nation’s highest court has been largely unknown, even to some of her biggest fans — until now. From her beginnings to the present, “RBG” is a revelatory documentary exploring Ginsburg’s exceptional life and career. Directed and produced by Betsy West and Julie Cohen, “RBG” stars Ruth Bader Ginsburg, Jane and James Ginsburg, Gloria Steinem, Nina Totenberg, Bill Clinton, Judge Harry Edwards, and Senator Orrin Hatch, among others. “What makes it memorable is its portrait of a woman with an exceptional intellect, to be sure, but also a lifelong capacity for staggering amounts of minutely detailed, unswervingly purposeful work.” — Joe Morgenstern, Wall Street Journal. Visit http://www.livefromauburn.com or call 530-885-0156 for more information.